Festivalkult 2018 – what a blast! …we’ve had such a great time at Festivakult umsonst und draussen! We entered the stage at 1:30 AM but the crowd was still wild. Thanks to the whole Festivalkult-crew and everybody who was involved. Check out our little gallery HERE! „What the hell´s going on with Hovercraft Hammerfist?“, people ask. Well. We just do what we always do. Playing, eating, sleeping. For the curious: Here comes a short video of a normal day in the life of Hovercraft Hammerfist. See you at Festivalkult umsonst & draußen! We enter the stage Saturday night at 01:30…. We made it into THE METAL ARCHIVES! 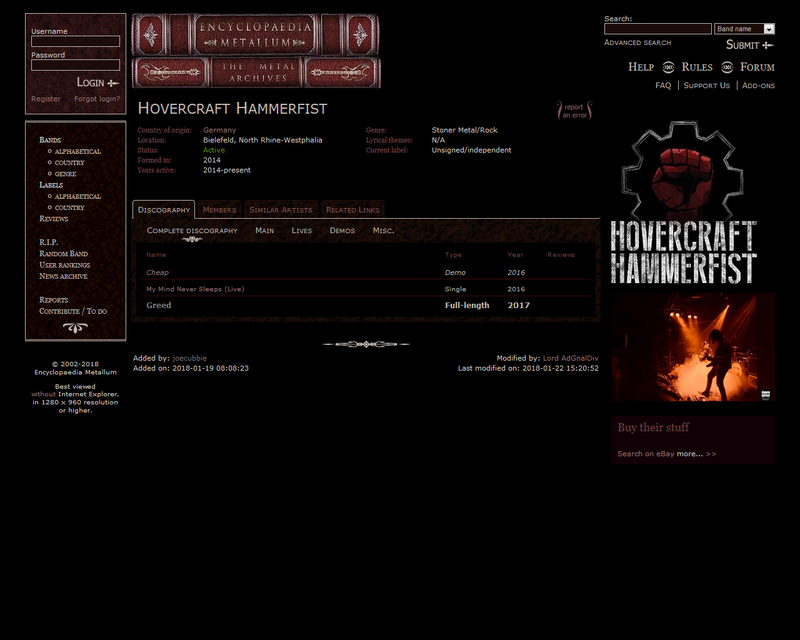 We just found Hovercraft Hammerfist listed in ‚The Metal Archives‘ or ‚Encyclopaedia Metallum‘. Great! Find the link here…. Here we go: Amazing review by Matt from #DecibelShower. Thanks, man! 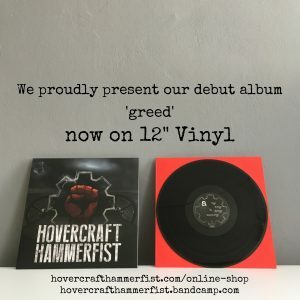 Hovercraft Hammerfist hail from the heavenly realms of Germany and their debut album, simply titled ‚GREED‘, packs a heavyweight punch that left an instant impression on me. It comes fully charged with eight tracks of sonic hurt, all delivered with a vulgar display of stoner power. It’s music that whips up a storm of passionate desert grooved rock, the dark hearts of the tunes showing a fine blend of influences from the likes of Sabbath, Danzig and Kyuss. The title track is first to rev up, belching thick black smoke like a bulldozer and pushing the track forward with an unstoppable ground shaking momentum. It sets the standard for what is to follow, an album packed with in-your-face growling rock numbers all firing off enough grit to strip the flesh from the most sensitive of ears. Each track is as heavy and as smoldering as the next, pulsing with a desert heartbeat at the core and surrounded by a heady mix of both classic and contemporary influences. Take something like the fiery, slow burning groove of ‚Raised In A Cave‘. The thunderous rhythm that rides below the surface acts like a catalyst, injecting a brooding current that keeps the power flowing with a loud, unrelenting assault on the senses. Yes, Hovercraft Hammerfist are just what the doctor ordered and the parting nine minute epic of ‚My Mind Never Sleeps‘ shows that this trio from Bielefeld are a true credit to the rock scene. A genuinely cool band with an immense sense of power. They have a true wealth of potential to offer and their natural talent at turning out quality tunes, combined with their confident and capable delivery of them, can only work in their favour. Was für ein cooler Abend gestern! Besten Dank an alle, die unsere Release-Party ermöglicht haben. Es war uns ein Fest, mit Der Draht die Bühne zu teilen. Die Bude war voll und viele von Euch waren bis zum letzten Ton vor der Bühne dabei. DANKE!!!!! Wenn jemand Fotos am Start hat, können die gern hier gepostet werden. An dem Brett, wo vor drei Jahren alles begann. Wir werden Euch mit unserem brandneuen Album ‚Greed‘ live und in Farbe beglücken und freuen uns auf den ein- oder anderen Thekenschnack!